KRAKOW, POLAND - SUMMER, 2016: Wawel cathedral on Wawel Hill in Krakow, Courtyard, parade ground. Poland. Shot in 4K (ultra-high definition (UHD)). 4k00:16KRAKOW, POLAND - SUMMER, 2016: Wawel cathedral on Wawel Hill in Krakow, Courtyard, parade ground. Poland. Shot in 4K (ultra-high definition (UHD)). 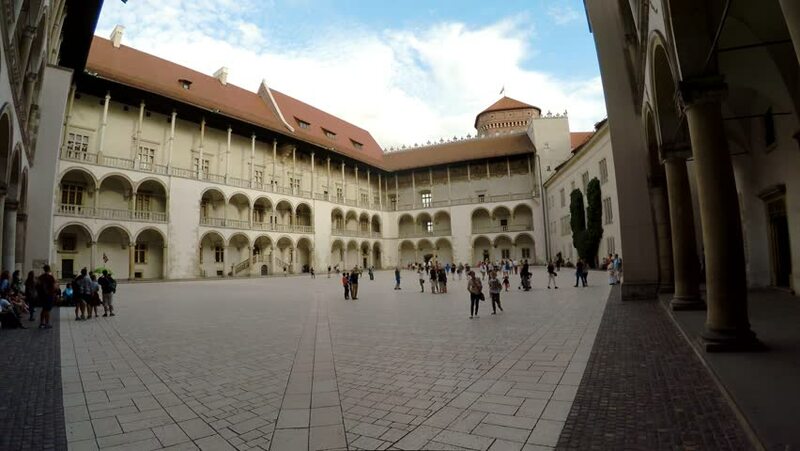 hd00:30The tiered arcades of Sigismund I Stary Renaissance courtyard within Wawel Castle, left bank of the Vistula river in Krakow, Poland. hd00:11Venice, Italy - April 2, 2016: Curtyard area of Palazzo Ducale. Doge's Palace in San Marco square. Inner court of Palazzo Ducale (Doge's Palace) on San Marco square, Venice, Italy. Vertical panorama. hd00:18ISTANBUL, TURKEY - JANUARY 10 : Courtyard of Yeni Cami, The New Mosque in Istanbul on January 10, 2014.The construction of the mosque first began in 1597 and finished in 1663.
hd00:23KRAKOW, POLAND - AUGUST 2017: The 16th century Renaissance inner courtyard of Wawel Castle. Cracow, Poland.